Secretary of the State Denise Merrill and Senate and House majority leaders, Bob Duff and Matt Ritter. Secretary of the State Denise Merrill opened a campaign Tuesday for Connecticut to join the vast majority of U.S. states allowing early voting, an idea that requires a state constitutional amendment to implement. Connecticut is one of 12 states without early voting at the polls and only one of three whose state constitutions currently bar it. In 2018, nearly 40 million Americans in 38 states and the District of Columbia went to the polls before election day. “This issue for me has been a long time coming, and I think it’s time has come,” said Merrill, a Democrat re-elected in November to her third term as the state’s top election officer. House Majority Leader Matt Ritter, D-Hartford, said House Speaker Joe Aresimowicz, D-Berlin, has made the constitutional amendment a priority of the House majority caucus. Leaders of the Senate Democratic majority say they also are strong supporters. “We want early voting on early voting,” Ritter said. Voters here rejected what Merrill called a poorly worded amendment — it talked about removing restrictions on absentee ballots and not early voting — by a vote of 491,447 to 453,070 in 2014. Amending the constitution is cumbersome, and the soonest a constitutional amendment referendum can be placed before the voters is 2020, meaning the first time early voting would be possible in a statewide election is 2022. There are two paths to place the question on the ballot, each requiring the General Assembly to adopt a resolution. If the House and Senate approve the resolution by a supermajority of 75 percent, then the question would go on the next statewide ballot in 2020. If not, an identical resolution must win simple majorities in successive legislative terms, delaying a referendum until 2022. 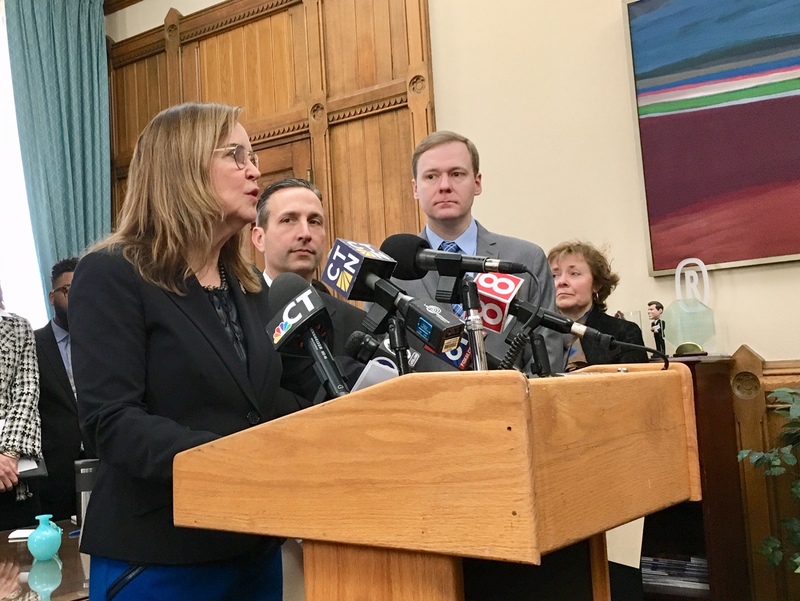 No Republican legislators attended Merrill’s press conference, but she said she is talking to GOP lawmakers and hopes the issue will find the bipartisan support necessary to place the measure before the voters in 2020. The necessary super majorities are 114 in the House and 27 in the Senate. Democrats hold majorities of 90-59 in the House and 20-13 in the Senate, with two vacancies in the House and three in the Senate due to the resignations of lawmakers who joined the Lamont administration. Representatives of AARP Connecticut, the League of Women Voters, Common Cause, the ACLU, ConnPirg, Indivisible and an African-American women’s sorority, Delta Sigma Theta, crowded into Merrill’s office to speak in support of the amendment. The proposed constitutional amendment would require a minimum early voting period of three days and permit longer periods set by state law. Laws allowing no-excuse absentee balloting, now prohibited by the constitution, also would be possible for the first time. Connecticut gets high marks in national studies for ease in registering to vote. It allows election-day voter registration, on-line registration and the opportunity for automatic registration at the Department of Motor Vehicles. But it falls short on ease of actually voting. “This is the last frontier in terms of being able to make voting easier in our state,” said Senate President Pro Tem Martin M. Looney, D-New Haven. House Minority Leader Themis Klarides, R-Derby, had no immediate comment, while Senate Minority Leader Len Fasano, R-North Haven, issued a statement in which he did not take an opinion on early voting, but talked about voter fraud. Documented cases of voter fraud at the polls are extremely rare. Most voter fraud cases in Connecticut have involved absentee ballots. Nora Duncan of AARP Connecticut said voter turnout nationally was 71 percent for voters 65 and older in 2016 and 46 percent for those 30 and younger. Connecticut saw a surge in voter registration in 2018 — a record 360,000 new voters, including 62,000 aged 18 to 24. She said a study by Cal Tech and MIT in 2015 found that long lines deterred at least 730,000 people from voting in the U.S. in 2012. The New York legislature approved a number of election reforms Monday, including early voting.